Don't miss out on the fact that it may not just be about steel and aluminum. Nothing like a good threatened pendulum swing well across center to force relief from other thorns (dairy supply management and softwood, to name a few). I do actually think there's more going on than an unrelated, sequential, one issue after another. In the 19th century the adage was to beware of the "Yankee trader." For example, the Alaska boundary dispute. Interesting to see that Trump's economic advisor just quit. It must have been a very frustrating job. Trump never really seemed to pay any attention to any differing points of view on the US economy: he twice made wrong claims about the US-Canada trade surplus, which he could have corrected by checking the Dept of Commerce, or the Office of the Trade Representative, but for some reason chose not to. I wonder what he bases his statements on? On Donald Trump’s threatened steel and aluminum tariffs, the Trudeau government has skillfully leveraged the network of contacts and allies built up over the past 18 months to secure Canada an exemption. 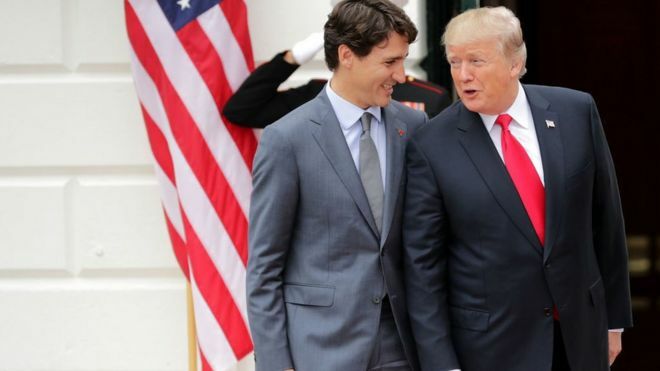 Trump listens to trudeau, one positive. Hmmmm.....Trump enjoys his women sucking up.....maybe he''s just bi? Chrystia Freeland probably has a more accurate take on Trumps change of heart. Foreign Affairs Minister Chrystia Freeland today praised all-party, pan-Canadian efforts to secure Canada a temporary exemption from Donald Trump's steel tariffs. Reacting to the decision by the U.S. president to "hold off" on imposing the duties on Mexico and Canada, Freeland said politicians of all stripes, stakeholders and businesses worked energetically to reach a positive outcome. "This has been a true Team Canada effort," she said during a news conference in Toronto today. You say that as if POTUS has just one economic advisor. I suspect there is a whole team of advisors. What I should have said, is Gary Cohn, the Chief Economic Advisor. Who, one would have thought, as "Chief" was the primary source of economic advice. Actually it's not so much advisors but his cronies that he phones every evening to ask them if he's still doing a great job and to tell him what to do next. The man knows very little and therefore takes much advice. Whoever gets to him last and flatters him the most usually gets listened to the most. My assessment also. He is astute, though, in that he knows how well the Big Lie theory works. I have come to believe that no matter what rubbish was to come out of his mouth, a large slice of the US population would believe him because he "says it like it is", which actually means he says it like they think it is, or want it to be. I suppose all politicians of all stripes use this device to some degree, but he is the most blatant I can recall in recent US history. Unfortunately, I think you are correct. Still it is better for the US than having narcissistic criminals as POTUS. No matter the reason, or outcome, I think Canada should tread lightly and not screw around. The steel and aluminum tariff was recinded for us. Again, no matter why the change of heart, but it happened. That was Trump's olive branch to get this done, as I see it. If the Trudeau government does not take their stupid social engineering off the table, quit being obtuse and get on with it, Trump is going to squash them like a bug, And I don't blame him. Doesn't matter though, China has been dumping here for years. We buy it, process it and sell it over the border. Had a contractor here that used over a million bucks worth of Chinese stainless steel for a highway project. One week into the installation it all had to come down and be replaced with North American stuff. It was rusting, even though the paperwork said it was top quality stainless. but he left his minions behind. The Liberals have potentially a lot to lose here. They have almost torpedoed the TPP, failed to capitalize on the CTA (free trade with the EU negotiated by the Harper Government), were kicked to the curb by China and now India on trade, and have conspicuously failed to fix or support the creation of hydrocarbon networks, isolating Canadian oil and forcing producers to accept steep discounts (Texas Intermediate is selling for @ $60 bbl, while Canadian Western Select is selling for $36 bbl. This is a huge differential and denies Canada billions of dollars of income). Being kicked to the curb by the US (and President Donald Trump is not a fan of NAFTA) will essentially knock over the last of the foreign trade props holding up the Canadian economy, but there seems to be no truly serious movement by the Liberals, who have effectively signalled they are simply not focused on the economy at all. The President discovered that the US ran a $2.8b trade surplus with Canada in 2017. Partly because of the steel we buy from China, then gets transshipped into the States. A surplus that small is pocket change and not worth the discussion. Trump throws all kinds of stuff out there. He's a master negotiator. Besides, he's not really involved in them is he? All this is just jockeying for position. The real negotiations are next month in the US. The United States by far accounted for the largest share of Canada’s imports by source country at 5 percent (4.5 mmt), followed by China at 9 percent (0.7 mmt), South Korea at 5 percent (0.4 mmt), Japan at 3 percent (0.3 mmt), and Taiwan at 3 percent (0.2 mmt). Notably, while Canada’s top source countries have shifted from year to year, the United States has ranked as Canada’s top import source for steel products for more than 20 years. The top 10 source countries for U.S. steel imports represented 78 percent of the total steel import volume in YTD 2017 at 21 million metrics tons (mmt). Canada accounted for the largest share of U.S. imports by source country at 16 percent (4.3 mmt), followed by Brazil at 13 percent (3.6 mmt), South Korea at 10 percent (2.7 mmt), Mexico at 9 percent (2.4 mmt), and Russia at 9 percent (2.4 mmt). So Canada imports more steel from US than it exports (4.5 mmt vice 4.3 mmt). Canada only import 0.7 mmt from China. The net delta then is 0,5 mmt. Given that the government is NOT a significant consumer of steel in Canada, and that most steel companies in Canada are foreign owned, I do not see any likelihood that Canada is "buying Chinese steel and transhipping it into the States". OMG!!! CTV lied. I wrote what they were saying while I watched their news story. Perhaps you should correct them, or Stats Canada where they say they got the info. Thanks for the rest of the story. See, I just start to trust Canadian content like I'm told to and then this happens. Oh well, you might have proved my long running point about the Canadian MSM. But then he undiscovered it. Or something. I can't quite follow his logic path. One thing he really needs to do is sack those pesky disloyal US Govt agencies that publish figures that don't support his argument. Or, better yet, just sack everybody who doesn't agree with him. Well, he signed off on that report. Are you saying he should fire himself? No, no, no!! Sheesh! Don't you guys get it? He works for Mr Trump and that's who decides! And he wouldn't try to do that because, he's like, really smart and he's said a lot of things. And he hears more and more people saying how beautiful and fantastic he is. And anyway, if he fired himself he wouldn't go because it would be Fake News. Soon all those irritating voices of experience, reason and order will be out of the way, so then the real fun can start. Drain the swamp!